Shibata, S. (2013). JASAL Forum 2012: Making a difference through self access. Studies in Self-Access Learning Journal, 4(1), 62-69. This article reports on the JASAL Forum held at the JALT Conference in Hamamatsu on October 13th, 2012. 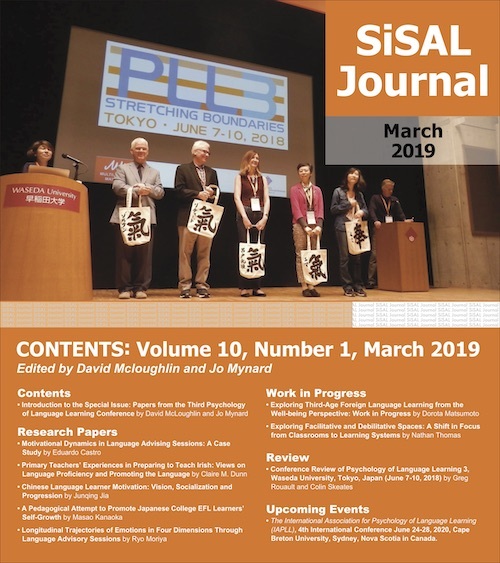 JASAL, the Japanese Association of Self Access Learning, was set up in 2005 by Garold Murray and Lucy Cooker to provide a support network for educators and administrators involved with self-access language learning centers (hereafter SACs) in Japan. It holds a forum annually at JALT (the Japan Association for Language Teaching) conference. It has been a great success and providing information and support to those who are involved with SACs in Japan. I am also blessed with all the information and support from the JASAL Forum as I work for a SAC as the director. The 2012 JASAL Forum consisted of a poster session, three paper presentations and an open forum discussion, with the theme of ‘Making a difference through Self Access.’ The presentations this year focused on how to foster autonomy, how to develop understanding of the value of self-access among faculty and administration, and how to integrate self-access with the curriculum. All the presentations provided a brighter vision for SACs in Japan. The theme of the 2012 JASAL forum, ‘Making a difference thorough Self Access’ was consistent with the theme of JALT 2012, ‘Making a difference.’ One of the differences SACs hope to make in their students’ lives is to help them develop the skills to become more successful language learners. In the last two decades, a number of SACs have been established in Japan with the purpose of offering effective self access support. Many face challenges, then find solutions, but still there are many more difficulties to be tackled. One of the common difficulties that many institutions face is how to develop understanding of the value of self access among faculty and administrators. Over ten years ago, Benson (2001) pointed out that “in many institutions, self-access centres have been established without any strong pedagogical rationale.” Now that is widely recognised as one of the most important factors, and most SACs do have strong pedagogical rationale, but some administrators or educators who are relatively new to SACs may still not be familiar with the importance of the pedagogical rationale behind SACs. That could create the situation that what SACs actually do may not be completely understood among those who are not strongly involved with SACs. Establishing “a box” does not bring learners there automatically. Nor does it foster autonomy automatically. Not only learners but also teachers need to be trained to be more autonomous in order to create a rich self-access environment. Reflecting on the content of the different presentations and posters, I identified two distinct themes: what SACs can do outside and inside of SACs. No matter how great a SAC is, if there are no users, it will turn out to be just space with some equipment and staff. We, those who are involved with SACs, need to consider what brings users there. In addition, not all the institutions have SACs and there are adult language learners who do not belong to any language institutions. In the Forum, how we could help those who have no access to SACs was discussed. I categorised both cases as what we can do outside of SACs. On the other hand, inside SACs, we could always make systems and an environment more beneficial to users. We think of what we can do to foster autonomy at SACs or in classrooms, which I define as something we can do inside of SACs. What Can SACs Do Outside of SACs? The existence of SACs does not guarantee frequent and effective use of them. Educators and administrators need to work not only inside but also outside of SACs in order to lead learners there and help them to make the most of SACs. I believe the key concepts, discussed in the Forum, for bringing learners to SACs would be developing understanding of self-access among faculty, fostering a culture of self-access learning, and spreading the idea of autonomy outside of SACs. Darrell Wilkins and Greg Lindeman from Soka University in Tokyo discussed challenges they faced when they encouraged students to use self-access language programs. They pointed out since the value and efficacy of self-access language programs often exist outside of the classroom, what students could do through self-access programs was not always clear to the teaching faculty, especially part-time teachers, who were not directly involved with them. Therefore a team at Soka University redesigned and developed their programs, highlighting their benefits and providing the faculty with the confidence to encourage students to use the facilities. They delivered the information to the faculty by holding lunchtime information sessions and introduced how their writing centre and Global Village work. The writing centre offers students a variety of one-to-one 30 minute sessions and students can also choose what level of support they want to receive from paragraph level to essay level. The writing centre is well staffed with ten to twelve current students as its staff members each semester, which enables it to offer eighty sessions a week. Global Village offers ten language programs with a variety of levels from beginner to high advanced level, making it practical for students. Redesigning the self-access programs at both facilities and delivering precise information on the facilities to both full-time and part-time teachers seemed to have helped to encourage students to use the SAC more. Wilkins and Lindeman suggested that it is important to develop understanding of the value of the facilities among the faculty and making the facilities more user-friendly. Developing a culture of active self-access use plays a significant role as well as developing understanding of the value of SACs among faculty. Some SACs struggle with bringing students there, and they remain underused. Toyo Gakuen University was once one of those SACs which were used only among a limited number of students. As Mynard (2012) points out ongoing action research is essential for continuous development, a team of Toyo Gakuen University has been working on their action research project to try to improve the situation there. They presented the action research project this year, following the 2011 JASAL Forum poster presentation. In 2011, Taylor et al. (reported in Kodate, 2012) investigated how to promote independent learning in the freshman English course, focusing on a stamp card system which was designed to help learners become more familiar with the facilities, materials, and systems there. This year Clair Taylor, Michael Stout, Jerry Talandis Jr, and Keiko Omura talked about how to build a culture of self-access learning, focusing on the importance of teacher training. They emphasised the necessity of more teacher involvement. They also insisted that making a visit to the facility part of the grade is effective. Although making ‘visits to the facility’ mandatory is likely to be inconsistent with the idea of self-access, it actually gives students opportunities to be familiar with the facility and eventually lead them to use it continuously in a voluntary basis. The team of Toyo Gakuen University concluded that the system has fostered a developing culture of independent learning on campus, with more students engaging in self-access study. Satoko Kato and Hisako Yamashita of Kanda Institute of Foreign Languages explained how educators can help learners take great advantage of self-access learning, focusing on the importance of integrating their language learning into everyday life. Their aim is to help not only those who are fortunate enough to access SACs but also those who have no access to such facilities. Some institutions do not have SACs, and others suffer from not getting the desired support from their institutions. Therefore, they insisted that it is important to spread the concept of self-access learning to those who are not familiar with it. Both Kato and Yamashita have eight years of experience as learning advisors and have conducted over 4000 advising sessions. Based on their considerable experience and various research studies they have conducted, they found three important keys to helping students to develop good learning habits: skills to control their own learning, metacognitive awareness, and reflective skills as language learners. For the purpose of scaffolding learners to integrate language learning into everyday life, Kato and Yamashita developed a new tool, called the English Learning Planner (hereafter ELP): a planner, a booklet and a website. The ELP consists of a personalized day planner, a booklet, and a website which learners can use to manage their own learning. Developing good learning habits does not happen immediately, but comes by everyday reflection on one’s own learning. The personalized day planner is designed to help learners to go through a preparation phase with nine activities, such as goal setting and finding a role model in order to raise metacognitive awareness. Kato and Yamashita set monthly themes based on the theories of learner autonomy. The booklet which comes with the day planner is written for the purpose of helping learners to develop knowledge on learning strategies and self directed learning skills. Furthermore, the ELP website offers more information to help learners find out their learning styles and other supporting materials. Since the ELP is written in Japanese, it may be the most beneficial for Japanese learners. Kato and Yamashita also suggest that the ELP can be used as supplementary material for classroom teaching, and in their institution over 700 students are going to take a self-directed language learning course with the ELP. What Can SACs Do Inside of SACs? It is important for learners to become familiar with SACs if SACs are accessible to them. Then what can we do inside of SACs once learners get used to using them? In the Forum, the potential of integrating self-access with the curriculum was discussed by a few institutions. Others discussed how autonomy could be fostered in the classroom. The idea of having visible ideal language learning models is also discussed as one of the important concepts in successful language learning within SACs. .
Herman Bartelen from Kanda Institute of Foreign Languages described how SACs would play an influential role in the English curriculum by providing opportunities and resources for self-directed learning in the classroom. Bartelen introduced five programs integrated with the curriculum. For instance, all the first year students visit the SAC, to know what they can do there. All English teachers are required to use the facility three times per semester, and then they are expected to teach in a mix of blended learning and self-directed learning. That gives students opportunities for self-directed studies. Learning advising in L1, not in L2, the target language, is also available at the centre. Advising in L1 may sometimes be necessary if learners are at a lower level of language proficiency and not yet ready to reflect on and talk about themselves in L2. Bartelen suggests that integration between SACs and the curriculum should be carefully designed to foster autonomy. Similarly, Anthony DiGiulio of Kanda Institute of Foreign Languages also talked about how to foster autonomy through reflections in the classroom. DiGiulio conducted some classroom-based research to investigate the effects of classroom-reflections in fostering autonomy. He used “class reflection sheets” (hereafter CR), giving students opportunities to reflect on themselves. CRs had a number of positive effects: students were more motivated to engage in classroom learning because they had to reflect later on, and rapport was strengthened between the teacher and the students because they were could have a different type of communication with CR. DiGiulio emphasized that regular, written self-reflections in the classroom can be an effective method in fostering “the first steps” towards learner autonomy. Elizabeth Lammons from Kanda University of International Studies also talked about reflections focusing on self-assessment of reading strategy use. Lammons conducted research over the course of a 15 week semester, giving her students opportunities to choose the authentic materials that they wanted to read and then use different reading strategies to make sense of the texts they chose: writing a summary after reading, writing unknown vocabulary, choosing self-assessed reading materials, and continuing the cycle. Samples Lammons showed in her poster presentation suggested the students perceived this learning cycle to be effective and learned to reflect on what they learned. Lindsay Mack from Ritsumeikan Asia-Pacific University discussed the design and implementation of exploratory research with the purpose of examining peer writing advisors’ reflective journals for the issues and problems they encounter. Based on observations and reflective journals of peer writing advisors, she suggested that since peer writing tutors are non-native English writers, they are more likely to be able to draw on their experiences as successful language learners to help learners. The effectiveness of peer advisers or teaching assistants is often discussed in the field of SAC research. Mack’s study confirmed that peer advising or support from student teaching assistants can also be effective in writing. In the 2012 JASAL Forum, two themes emerged from reflecting on all the presentations and poster presentations: what we can do outside and inside of SACs in order to foster autonomy. Outside of SACs, to encourage learners to use SACs, two key concepts were discussed: to develop understanding of the value of self-access language learning among educators and administrators, and to develop culture of self-access language learning on campus. It was also discussed that if SACs were not accessible to learners, they could possibly use an assisting tool such as the ELP to integrate language learning into their everyday life. Inside of SACs or classrooms to foster autonomy, the presentations suggested the effectiveness of integrating self-access language learning with the curriculum. In both SACs and classrooms, it may be possible to help learners become more autonomous through reflections with the help of educators and peers. The 2012 JASAL Forum gave us opportunities to reflect on what we can do both inside and outside of SACs. I would like to thank the two anonymous reviewers for thoroughly reading the paper and providing their valuable and thoughtful comments and suggestions to improve the quality of the paper. I would also like to thank all the presenters who shared their ideas at the JASAL Forum, giving me opportunities to think and broaden my vision. Satomi Shibata is the Director of Foreign Language Study Support Center, Tokoha Gakuen University. She is also a lecturer there. She has been involved with self-access centers for over eight years. Mynard, J. (2012). Does ‘Self-Access’ Still Have Life in It? : A Response to Reinders (2012) Retrived on Feb 24th from http://blog.nus.edu.sg/eltwo/2012/06/13/does-%E2%80%98self-access%E2%80%99-still-have-life-in-it-a-response-to-reinders-2012/2.